I was expecting absolutely nothing from Liverpool at Anfield, my only glimmer of hope was that Mané was missing. For Saints the back five were as before, the midfield was the returning James Ward-Prowse, Romeu and Davis. The front three were Tadić, Gabbiadini and Boufal. For Liverpool, Lallana was on the bench, still not quite 100% after his injury. In the morning papers it was called the game Klopp simply had to win, if they were to have a hope of playing in next season's Champions League. The Sky commentators stressed the 'legion' of former Southampton players at Liverpool. I make that Lovren, Clyne, Lallana and Mané, which is four in my book, in the Roman Army a legion was anything from three to six thousand men. So with Lovren and Clyne obviously representing some two thousand men, Saints were clearly in trouble straight away. Over the past couple of games I have got into the habit of giving a blow by blow account of the match. That isn't possible in this case, as there were no blows to speak of in the first half. Saints had clearly come to Anfield with the sole intention of getting a point. That first half wasn't without it's peculiar fascination. It was a bit like two boxers circling each other in the ring, trying to avoid throwing any punches. I found myself increasingly drawn to watching Klopp on the sidelines - if he doesn't already have blood pressure problems, then he will have them after this match - he was going mental. The BBC's reporter said it was probably the worst first half of a game he has seen this season. He clearly didn't see the Hull game then. Anyway, enough of that. That's given that 45 minutes of football more than enough attention. I thought that things might change in the second half. It did, but not by much. In fact we can skip straight to the major talking point of the match in the 60th minute. The ball came over the Saints penalty area and floated over Jack Stephens head. He then seemed to try and bat it away with his shoulder, but the ball (of course) hit his arm. There was not a moments hesitation from the ref and he pointed to the spot. There then followed some arguing and shouting, but none of that was going to help. The frustrating thing was that Stephens had been outstanding in the game, up until that point. Milner picked up the ball to take the penalty and while all the arguing was going on in the background, Forster walked up to Milner and just stood there towering over the Liverpool man. Lookat the pictures on this page, particularly the one beneath the stats, where Forster looks as if he is kissing Milner on the top of his head. Anyway. All the argy-bargy finishes and Milner steps up to hit the ball low and to the right, but Forster has guessed correctly and a huge hand scoops the ball away. Brilliant. Cue all the Saints fans at Anfield going mental. From the kick off, the game meanders on in the same fashion as before. Puel brings off Boufal and sends on Redmond. A few minutes later he takes off the forlorn looking Gabbiadini and sends on Long. Why? Neither substitutions made any sort of sense in the context of the game. The game sort of petered out, until out of the blue Liverpool actually tested Forster, the big man actually having to tip over a testing shot from the Liverpool substitute, Grujic, who had replaced Wijnaldum with just 3 minutes of normal time left. So, that was that. Although it must have been awful to watch from a scouser point of view, it was a really hard fought point by Saints. Some of the defending was on the heroic side, Forster and the back four were awsome and that is still allowing for Stephens conceding a penalty. All Saints stats, bar one, were awful, with only four shots all game and not one of them on target. 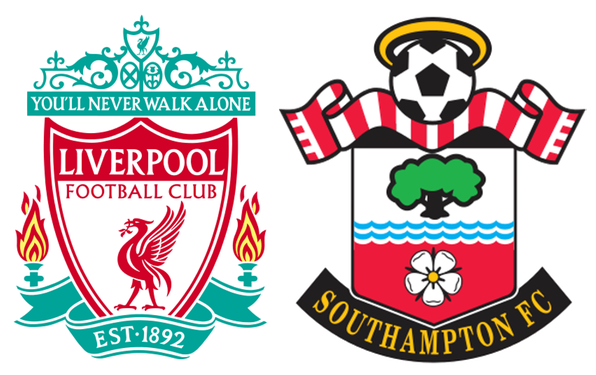 The really good stats were that Liverpool have not beaten Saints in four games this season. Better than that - they haven't even scored a goal against us! So, next up - Arsenal at St.Mary's on Wednesday night. Got to be the big man hasn't it? Forster has got a lot of stick for some of his performances this season, but I am still convinced that he has been carrying an injury from very early on, probably about the same time as his understudy McCarthy was injured. Does his showing in this match mean that he is now over whatever it was?